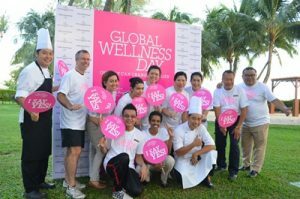 Shangri-La’s Rasa Sayang Resort & Spa, Penang, together with Golden Sands Resort, Penang, will join the world in celebrating Global Wellness Day on Saturday, 10 June 2017. The health and wellness event, the first one of which was organised by the two resorts last year, is now on its second edition. The event dedicated to “living well, both physically and spiritually” will be held in the garden of Shangri-La’s Rasa Sayang Resort & Spa, Penang from 8 to 11 a.m. The four-hour programme, with the slogan “one day can change your whole life”, will see a host of fitness and spa activities aimed at promoting healthy and mindful living open to the public. During the event, participants will enjoy healthy and fun activities, such as yoga with Janis Tan, a registered yoga teacher with Yoga Alliance; a Zumba dance session with Wan Shin, Penang’s Zumba and fitness instructor; and a talk on “Guide to Wellness” with Jojo Struys, TV presenter, speaker, author and wellness personality. In between the activities, the resort will serve all participants detox juices and a free sample of Pevonia Botonica spa products will be given away on a first-come-first-served basis. The programme also includes a lucky draw offering holiday prizes, free buffet dinners and an Instagram hashtag contest for the best photo taken during the event. “With the participation of Shangri-La’s Rasa Sayang Resort & Spa and Golden Sands Resort in Global Wellness Day, we hope this helps guests, colleagues and communities find their #ParadiseWithin on Global Wellness Day. Guests and the public can join the movement by hashtagging their post with #ParadiseWithin and #GWD2017. The event not only gives us a greater sense of place, but also allows us an opportunity to share amongst friends that we care for our wellbeing and health. Global Wellness Day is all about encouraging healthy lifestyles and positive living. What better way to spread the word than through the global connectivity of social media,” said Joshua Tan, organiser and manager of CHI, The Spa. “We look forward to sharing, liking and following online the collective journey on living well of our guests and colleagues”.